Cycling has a variety of health benefits, however, research has shown that it does not help create strong bones. In fact, depending on the amount of cycling you do, it may even decrease your bone density. So, if your only form of exercise is cycling, you may end up with weaker bones than those who are inactive. There is a lot of research on bone health and a fair amount on bone health for cyclists2. 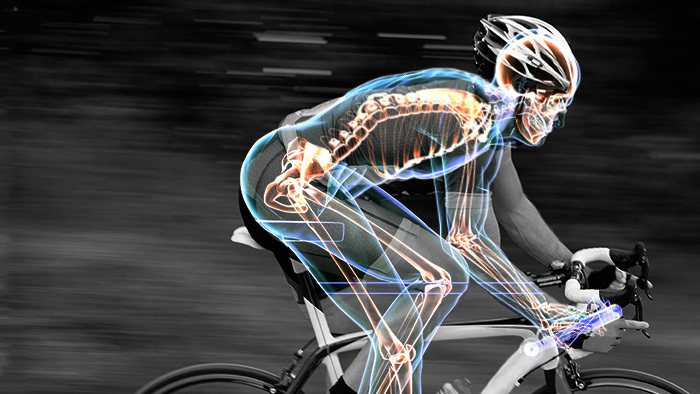 Here are several reasons cyclists have lower than normal bone densities. The primary reason for cyclists having low bone density is that it is a non-weight bearing activity. High level cycling in particular has been shown to have negative effects on bone strength because of the amount of time cyclists spend training and riding. You are spending a lot of time seated, with no compression forces on your spine and pelvis. Even though it may feel like you are pedaling hard at times, the forces you are putting into the pedals are not distributed in a way that puts significant strain on your bones, which is needed for bone growth. Necessary recovery time from hard cycling usually involves additional non-weight bearing activity of sitting or lying down. Most cyclists reported avoiding weight bearing activities during recovery periods as a way to help enhance recovery from training. Cyclists are generally lighter, and low body mass is also a risk factor for osteoporosis and osteopenia. This especially applies to women (who in general have lower body mass) as well as to cyclists who are consistently striving to obtain a low body weight in order to improve performance. Whether you compete or just ride for fitness and fun, chances are at some point you will take a fall, or be involved in a crash. This applies to any level cyclist, whether you ride solo, with friends, in groups, or compete in rallies and races. If you are a road cyclist, especially if you train hard or have been training for multiple years, you are more likely to develop osteopenia or osteoporosis. This puts you at a higher risk for fractures; a risk that continues to go up with age and training. More masters were classified as osteoporotic compared to age-matched, non-athletes, and the percentage of these increased significantly after a seven-year period.1 So, for those of you in this category, you are not only more likely to be at risk, but the risk factor is higher as you complete more years of cycling training. In 2012, there was an extensive review of 31 studies on the subject2. The findings were that adult road cyclists who train regularly have significantly low bone mineral density in key regions. This was found to be true when comparing the cyclists to control populations of both athletes in other sports as well as non-athletes. Areas of the lumbar spine, pelvic and hip regions, and femoral neck were all key areas found to have lower values in road cyclists than the controls. Included in this review were only a few studies involving amateur or low-level cyclists. Differences in bone mass were not found between the cyclists and controls when comparing with low level cyclists. However, studies that examined elite cyclists, or those training at high levels for numerous years, consistently found low bone mineral density in the elite and experienced cyclists. This further supports the idea that your level of training and the number of years you spend training are strong factors in your risk for low bone density. Road cycling at a competitive level might be more detrimental for bone health than mountain biking and recreational forms of cycling. This is due to all the reasons stated previously. Long hours on the bike, non-weight bearing. No impact forces, low forces in general while pedaling, and a lot of time off your feet trying to recover from training. Mountain bikers, however, were found to have higher bone mineral density than road cyclists. One reason given for this was the vibrations endured off road. Depending on the level of mountain biking, the increased short durations of high force to get over obstacles may also help. Sprint trained cyclists have stronger bones than distance trained cyclists. This makes sense because of the large forces they generate for short periods of time. The leg muscles are creating high forces, which in turn puts high forces on the bones they are connected to. The high forces for short durations are similar to the demands of weightlifting. However, keep in mind that as a non-weight bearing activity, as hard as you might go as a sprinter, compression forces on the spine are still not present. Triathletes and Duathletes: the combination of cycling and running counteracts the negative effects on bone mass that cycling alone may result in. Duathlon and triathlon training do not have the same negative effects as cycling training alone. Most of the differences in bone health were considering those older than 17 years of age. It is worth mentioning that the observation of cycling in the early years of life did not negatively affect the bones. However, it doesn’t positively affect the bones either. Participation in other sports has been shown to positively affect bone growth more than cycling does. We all want strong bones that are resistant to breaking; especially as we age. This is even more important for cyclists. Let’s face it, a crash or fall at some point in your cycling life is likely to happen. Stacking the odds in your favor by including activities to maintain and stimulate bone strength is your best line of defense against a fracture if you do happen to hit the ground at a greater impact than you would like. The aspects that account for bone strength include bone mineral density, content, bone size, and thickness. When muscles contract they pull on the bones to which they are connected. These forces provide the stimulus for bones to grow both thicker and denser. Maximal strength training and impact forces are the best way to provide this stimulus to your bones. A bone needs to experience a tenth of the amount of force needed to break it in order to be stimulated enough to create increased bone density3. Remember this key factor in your strength work. Don’t be afraid to lift relatively heavy weights, and add some plyometrics and impact training into your program. Some examples might be jumping rope or any kind of jumping, or, even punching a bag for fun to provide some impact for your upper body. Adding these things to your program AFTER developing a foundation will ensure that you are ready for the higher forces that these often place on the body. Strength training results in your body’s ability to actually increase the amount of muscle fibers that are fired, as well as, how fast they are able to fire. Both of these things result in the muscle being capable of producing more force, which in turn, means more forces exerted upon the bones to which they are attached. In addition to providing greater forces to stimulate bone growth, strength training also reduces risk factors that result in broken bones by increasing muscle mass and improving balance. This is especially important in masters populations at any activity level. If you have better balance, more strength and muscle, and stronger bones, all of those things come together to make you more physically resilient and stable. You will be better prepared to handle that unexpected gust of wind or pothole due to increase core and total body strength and stability. If it happens that you are involved in a crash, your bones are less likely to crack under the impact. Now, you have two ways of staying off the injury list. 1. Put random forces on your bones to stimulate growth. Some research has shown that the best results in the short term come out of subjecting bones to high forces in a more random fashion. Shorter term training programs of more random high intensity forces on your muscles and bones have actually been shown to be more effective than programs that progress over time. Now, this is contradictory to a program you might put together for performance gains, but it is still something that should be considered if you are concerned about improving your bone strength. Also, these are short term results. It doesn’t mean you shouldn’t periodize your program, as longer periods may be needed to produce the benefits to bone density in that case4. If you are following a periodized program and want to make sure it addresses your bone health, my suggestion would be to continue to do so. However, make sure to include one or two exercises that target bone health regardless of what the overall program goals are. The goal of these movements is to provide the forces on your bones to stimulate adaptation. 2. Select exercises that involve large muscle groups. The movements involving the larger muscles or multiple muscle groups are all good choices, assuming an adequate amount of resistance is used. This is because the larger muscles can produce more force than the smaller ones. Multiple muscles working together will also be able to generate more total forces on the bones as well as provide forces in multiple planes of motion. 3. Allow for longer rest periods between sets to allow for greater force production. Circuit training is a type of training program where individuals are performing movements, one right after the other with little rest, and then repeating the circuit multiple times. It has NOT been found to be as effective for bone and muscle growth. The reason for this is due to the lower amounts of resistance used, because of the short rest periods, and the forces you can push are lower. Circuit training may still help with bone health in the long term and is still great exercise. However, if stronger bones are your goal, design a program that involves more strength, higher forces and longer rest intervals. This will allow for more maximal forces to be produced during the sets. 4. Choose movements to load key areas of the body. The results of these studies support that bone density is site-specific. This means that all of the bicep curls and chest presses in the world will not help you increase bone density in your hips and pelvis as much as doing lower body movements. Lumbar spine stress is achieved by loading weight on the back, such as doing deadlifts or squats with weight, and by performing sit-up type movements and back extensions. Stress on the femur occurs when legs are put under heavy load or impact forces. So if you want strong bones in your hips, legs and spine, make sure you are including movements that target those areas. Or conversely, if you have a particular area you are concerned about, make sure and give that area some more love with some additional site-specific exercises. 5. Include Jumping, Sprinting and Plyometrics in your program. Plyometrics are movements that enable a muscle to reach maximum strength in as short a timeframe as possible. In addition, the movements make use of the elastic properties of the muscle to generate an even more forceful contraction. They train the neuromuscular system to fire off more fibers, which also creates more force. An example of a plyometric movement would be Jump Squats or Lateral Cone Jumps. The faster the muscle is stretched and lengthened as it controls your deceleration, the more energy is obtained from the elastic properties of your muscle fiber, and the stronger the following contraction will be5. Any of the plyometric or jumping exercises are good choices for stimulating bone growth because of the high forces of the muscle contractions, as well as impact forces they generate. Impact sports in which loading is applied unevenly and at a high rate also provide more stimulus for bone growth. So, if you participate in sports such as tennis, basketball or other activities that involve jumping, accelerating or quick changes of direction, you have a definitive advantage when it comes to maintaining strong bones. If this is you, strength training is also crucial to ensure your muscles and tendons can handle these high forces. In addition to suspension training movements, consider adding movements where the spine is placed under load, such as squats with a bag, bar or employ the use of a standing machine. Loading up a leg press might be beneficial for the hips, but will not put the necessary compression forces on the spine which are lacking the most in cycling and are the most important for cyclists to include. The “Farmer’s Walk” (an exercise where you are simply carrying heavy weights), heavy kettlebell or dumbbell, or barbell work, kicking, punching, or flipping heavy bags, jumping rope, high intensity running, shuffling or cutting, and jumping, are also all good additions that will stimulate bone growth. These things can supplement your suspension training program as well, if you have access to additional equipment. An example of this would be performing a suspended squat jump, followed by a suspended pushup with high resistance, and a sprint to the end of the block. These would be three extremely beneficial exercises to stimulate bone growth. If you are concerned about your bone health, it doesn’t mean you need to turn your program upside down. Simply include one or two exercises that stress your legs, hips and lumbar spine in a random manner with some impact and force. If you are just starting to strength train, or have knowledge that you already have low bone density or osteoporosis, the more explosive exercises should be phased in gradually as you improve your strength and fitness level. Always develop the foundation before adding higher intensity, or more specific work to your program. Just keep in mind that being consistent and including bone building activity in your program during the long term will produce benefits.